What's better than slicking on a really great lip balm? Slicking on one that helps to end domestic violence. 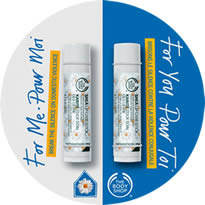 So the new lip balm duo, The Body Shop Stop Violence in the Home Shea Lip Care Stick Duo, is definitely something worth looking into. Community Trade shea butter from Ghana and tons of vitamins (A, C and E to be exact) keep lips soft and super-smooth. The formula isn't at all waxy or sticky, instead it's moisturizing and emits the faintest delectable scent of coconut. All proceeds from the sales of this duo go toward The National Coalition Against Domestic Violence. This organization provides support and services to women and children affected by domestic violence. The duo itself is crafted in an ingenious "one for me, one for you" design -- a round card holds two of the tubes. If you're feeling generous, you'll share with a friend ... though if you're like this beauty chick, you may have to just keep both tubes on hand for yourself!